The global hollow fiber ceramic membrane market is prognosticated to expect high growth opportunities birthing with the rise in demand observed in chemical processing, water and wastewater treatment, and pharmaceutical industries. Manufacturers could increase sales in the global hollow fiber ceramic membrane market as municipalities show improved uptake of their products. On the other hand, reduced installation expenses and affordable cost of products are projected to augur well for the global hollow fiber ceramic membrane market. The global hollow fiber ceramic membrane market is envisaged to register an 11.0% CAGR during the forecast period 2016-2025. In 2016, the global hollow fiber ceramic membrane market secured a valuation of US$99.0 mn. On the basis of application, the global hollow fiber ceramic membrane market is classified into three segments, viz. nanofiltration, microfiltration, and ultrafiltration. According to the report, microfiltration is forecast to account for a larger part of the global hollow fiber ceramic membrane market in terms of value. In 2016, it collected a 40.0% share of the global hollow fiber ceramic membrane market. However, nanofiltration could show quicker growth in the global hollow fiber ceramic membrane market as it logs a more than 13.0% CAGR during the said forecast period. As for microfiltration membranes, they are predicted to gain higher demand in the global hollow fiber ceramic membrane market due to their ideal use in a number of industries such as water, paper, paints and coatings, biological, pharmaceutical, food, and dairy. Nanofiltration membranes are also used in several industries and for concentrating dyes and sugar. By end use, the global hollow fiber ceramic membrane market is segregated into food and beverage, pharmaceutical, water and wastewater processing, chemical processing, and biotechnology. Amongst these segments, water and wastewater processing is prophesied to bag a lion’s share of the global hollow fiber ceramic membrane market. Increased expenditure on infrastructure development coupled with rising demand for smart infrastructure could boost the growth of the water and wastewater processing hollow fiber ceramic membrane market. The global hollow fiber ceramic membrane market is foreseen to witness the dominance of Asia Pacific in the next few years. In 2016, the region took control of a colossal share of the global hollow fiber ceramic membrane market. Rising reclamation requirements and wastewater treatment standards could push the growth of the hollow fiber ceramic membrane market in the region. 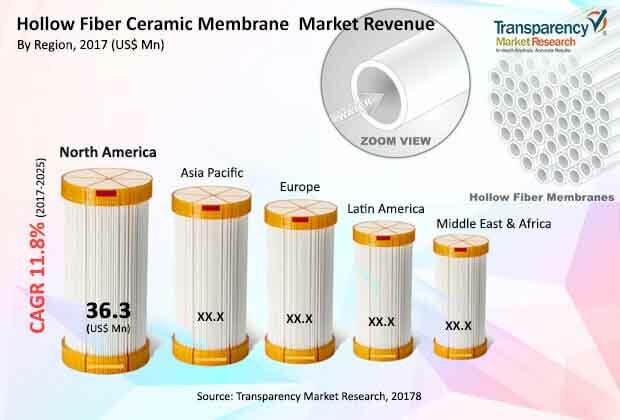 Increase in the scarcity of freshwater and improved awareness about membrane systems are envisioned to raise more demand in the regional hollow fiber ceramic membrane market. North America could show moderate growth rate whereas Europe is expected to slow down growth because of its mature market status. However, North America could bank on commercial and industrial development and telling demand for hollow fiber ceramic membrane to treat wastewater in the U.S. The global hollow fiber ceramic membrane market includes top players such as CoorsTek, Inc., Atech Innovations GmbH, and Media and Process Technology Inc.